Position oven rack 4 inches from broiler element. Spray 18x13-inch rimmed sheet pan with cooking spray. In large bowl, mix 2 tablespoons of the vegetable oil, the cumin, coriander and salt. Add corn, bell peppers and onion to bowl, and toss to coat; transfer to pan. In same large bowl, mix remaining 2 tablespoons oil, the taco seasoning mix and ground red pepper. Add steak; rub mixture in to steak. Transfer to pan with vegetables. 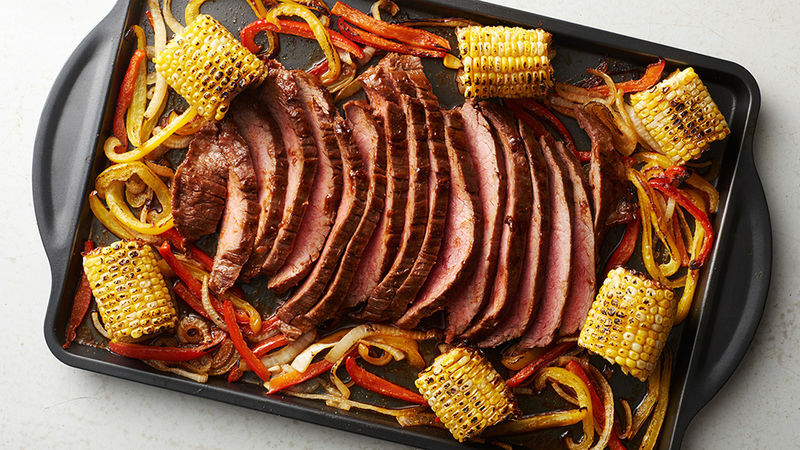 Broil 8 to 10 minutes, turning steak and stirring vegetables once, until instant-read thermometre inserted in thickest part of steak reads 135°F (for medium). Transfer steak to cutting board; cover with foil, and let steak rest 5 minutes. Stir vegetables in pan; return to oven, and broil 4 to 6 minutes longer or until vegetables are blackened in spots. Thinly slice steak on the bias, against the grain. Serve with vegetables in tortillas with toppings. If your oven’s broiler only covers the centre of your oven, start steak in the centre of the pan, then thoroughly stir vegetables and position them in centre while steak rests to ensure all elements get plenty of time directly under the flames. If desired, cut corn from cobs for serving.